Premium Cabinets of St. Louis is the premier kitchen cabinet and bathroom vanity provider in the St. Louis area. We take pride in on our excellent customer service record and strive to deliver the perfect cabinet to everyone of our customers. 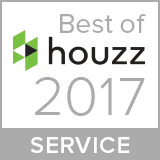 We are Houzz Service award winners for 2016 and 2017, which we received for our dedication to our customers! The cabinets at Premium Cabinets of St. Louis offer high quality features at a price that our competitors can’t match. Our cabinets are made with an all wood construction, and are made from premium grade birch plywood and maple. Our cabinet drawers are made with dovetail construction, creating a more true and stronger joint that will hold more weight and be more durable. Our drawers come standard with soft closing, which means no more slamming or banging drawers in your kitchen. You will not find a better quality cabinet from our competitors that can beat our prices. Our customers satisfaction is Premium Cabinets of St. Louis’s priority! Our showroom in St. Louis is open to customers to come design their dream kitchen. Contact us now to get started on building your dream kitchen!